The most dangerous airports in the world | In fact, there is no official release from e Air Traffic Organization that refer the most dangerous airports in the world. It because there are so many airports that have extreme locations and can deserve to be called as a dangerous airport. So It will be many versions about this. But, according to the hubpages.com quick polling, from 13 airport that considered as dangerous airports, The Tenzing-Hillary Airport is chosen as the most dangerous one. 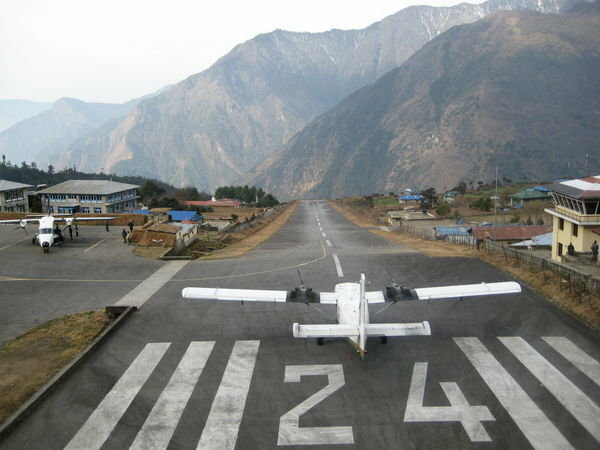 Tenzing-Hillary Airport A.K.A Lukla Airport is a small airport that located in Lukla, Khumbu, Solukhumbu district, Sagarmatha zone, eastern Nepal. Lukla is the place where most people start the climb to Mount Everest Base Camp, so, arguably, the airport is located in a very extreme location. The high winds and extreme cloud cover is increased the dangerous level at this airport. But, nevertheless, This airport is still serve daily flight to some major destinations like Kathmandu, Phaplu, and Rumjatar.